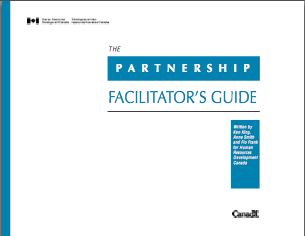 This facilitator’s guide is intended to assist you in facilitating a discussion about partnerships with people who have read through The Partnership Handbook. The Handbook was created by the Labour Market Learning and Development Unit of Human Resources Development Canada. It was designed to support the understanding and effective implementation of community partnerships. to assist the group to develop strategies for responding to as many of these issues and challenges as possible.